The design of the Korean cover is centred around an image illustaration. 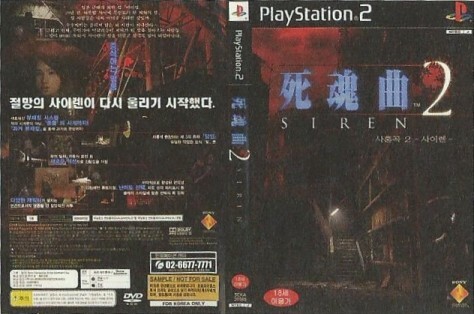 As you will see if you refer to the cover of the book "Haikyo no Arukikata (Walking the Ruins)", the image is of a model of Gunkanjima's famous "Hell Steps", one of the most impressive locations in Siren 2. The title of "死魂曲" (Song of the Dead) is a kanji representation of the title for use in versions released in Asia. The cover of the European (UK) version - very unlike the other versions, which have illustrations as the main feature - is composed around a close-up of a Yamibito's face. With the way it is set up, a vaguely bloodcurdling image rises out of the simple and subdued design. 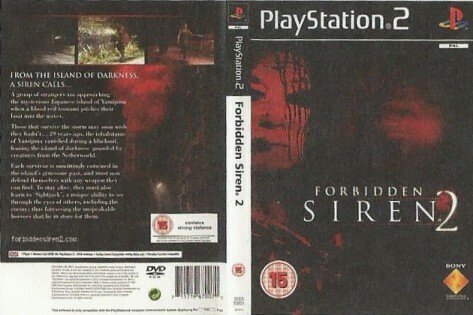 The title of the European version is Forbidden Siren, just like it was for the first game.